Did a bit of blog housekeeping (blogkeeping?) today, and came across this pic I uploaded from my phone last December, but never actually published... not sure why. Anyway, this is a Manchego I made last year (and then aged in an Olive Oil bath for two months). Not sure I need to repeat the olive oil experiment, but I do like this picture. Yup, this was before aging. 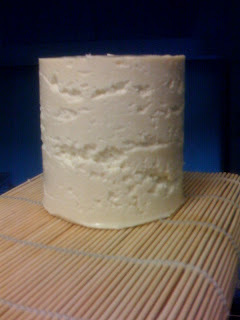 The interesting thing about aging it in the olive oil--completely submerged--was that it was a very, very moist cheese. It almost had the texture of a "pastuerized-processed" cheese, akin to (gasp!) Velveeta. Probably a better way to go next time would be to age it in the cave (with a light coating of olive oil to keep it from drying out too much) for the first month or two, and then let it rest in the olive oil for a week or so. OR, maybe soak it in olive oil for the first week, and then take it out? Not sure what effect this would have, but might be worth a try!